So far so good for the Ligue 1 leaders. A match report from this game will appear on the BBC Sport website. Six straight league and cup wins, 22 goals in the last half a dozen games, Neymar, Luis Suarez and Lionel Messi on the score sheet...and seven points clear at the top of La Liga. Lionel Messi is certainly making up for lost time after his long injury lay-off. 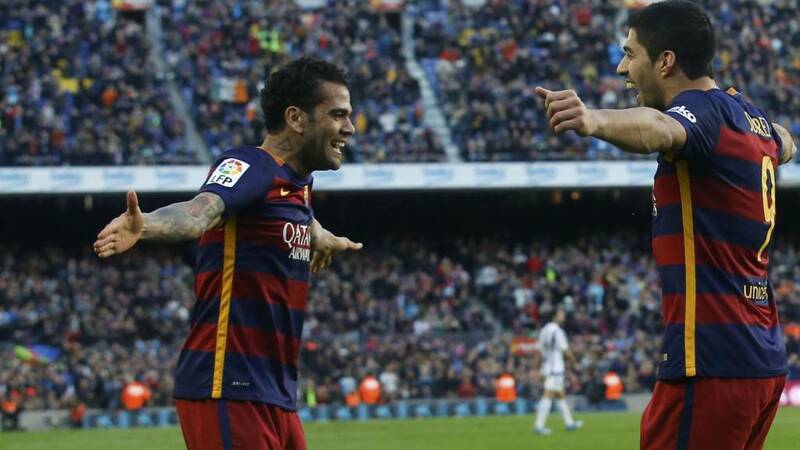 The Argentine seals an emphatic Barca win after meeting Neymar's cross. That's Messi's third goal in two games. Real Sociedad have been on the backfoot most of the match but they are finishing strongly. Only a great save from Claudio Bravo denies Bruma a consolation. Two minutes of normal time remaining. These were the scenes at the Parc des Princes before kick-off in what is Paris St-Germain's first home game since the Paris attacks. Barcelona are going seven points clear at the top of La Liga...unless Real Sociedad perform a truly spectacular comeback. Edinson Cavani makes the breakthrough for the Ligue 1 leaders at the Parc de Princes with a sublime finish following good work by Angel Di Maria. Times chief football writer Henry Winter: "Lionel Messi is not being badly paid by Barcelona. Lifestyle wise Barcelona is quite nice. "He is also an intelligent individual who looks at his career and thinks if he comes to the Premier League with no winter break, with the Capital One Cup, which he probably won't play him in, there is the FA Cup as well...he will be exhausted by the time the major honours are contested. "If he is going to be rated among the greatest players of all time, and you look at Pele and Diego Maradona being in the top two in terms of the World Cup, Messi has still got to deliver a World Cup. Maybe it is all about the money but I just think with Messi it is about the career and his standing in history." Barcelona are getting closer and closer to a fourth goal. This time Lionel Messi's free-kick flashes past the post. Pep Guardiola's Bayern extend their lad at the top of the Bundesliga to...11 points. Goals by Thomas Muller and Kingsley Coman seal a 13th win in 14 league games this season. Lionel Messi is still hunting his first La Liga goal for two months. He goes ever so close with a volley that flies inches wide of the post. Barcelona are not sitting back. They want more goals. Two big early chances for Paris St-Germain to take the lead - both falling to Edinson Cavani. Still goalless. You just can't stop this man. Neymar bags his second of the match and his 14th in 12 La Liga games this season after slotting home from Jeremy Mathieu's cross. Real Sociedad appeal for off side but the celebrations begin. Emotional scenes at the Parc des Princes. Players and fans sang Le Marsellaise - the French national anthem - together before kick-off. This is Paris St-Germain's first home match since the Paris attacks. The game is under way. Back under way at the Nou Camp. Barcelona are going seven points clear at the top of La Liga unless Real Sociedad come up with something extra special in the second half at the Nou Camp. We're about to get under way at the Nou Camp. Bolton Wanderers manager Neil Lennon: "I'm looking at Barcelona now and they look like they are on the cusp of greatness with the way they are playing. It's very early in the season. I didn't think I'd see a team as good as the Barcelona side that beat Manchester United in the 2011 Champions League final at Wembley. But this current team is starting to show a lot of similarities to the one four years ago." This is the scene inside and outside Paris St-Germain's ground as the Ligue 1 leaders prepare for their first home game since the Paris attacks on 13 November. Barcelona are coasting thanks to goals by Neymar and Luis Suarez. Is Lionel Messi going to come to the party? Barcelona double their lead four minutes before the end of the first half. And what a goal. A wonderful Barca attack ends with Luis Suarez hammering a volley into the back of the net in spectacular style. A wonderful effort from the former Liverpool man. Times chief football writer Henry Winter: "The Pep Guardiola link is slightly more do-able. You can see the logic in terms of the individuals in power at Manchester City. "Guardiola has talked very politely about English football in the past but from a footballing romantic prospective why leave this Bayern Munich side? They have got some decent players there. "I know Barcelona are probably the best team in Europe at the minute but Bayern Munich are playing some of the most beautiful football. Maybe sometime after Christmas Bayern Munich will announce a new contract for him. He is a special manager." It is not only Lionel Messi who Manchester City want. The Premier League big-spenders also want Bayern Munich boss Pep Guardiola. According to Saturday's Daily Mail, Bayern will fight to keep Guardiola as speculation intensifies over him joining City. First yellow card of the game for Real Sociedad's Yuri Berchiche for a challenge on Ivan Rakitic. French Ligue 1 and Ligue 2 matches will be played without away supporters for a second successive weekend on government orders in the wake of the Paris attacks. The French football league - the LFP - also said the ruling is set to apply for the subsequent three rounds of Ligue 1 games, the next two rounds of Ligue 2 fixtures, along with matches in the Coupe de France, Champions League and Europa League. It means travelling fans will be able to attend games again on December 18-20, the final weekend before the French game goes on its Christmas break. We'll bring you score updates from the first half of Ligue 1 leaders Paris St-Germain's game with Troyes. It is the first time PSG have played at home since the attacks on 13 November. It was only a matter of time. Neymar makes it 13 goals in 12 La Liga games this season with a composed left-foot finish following good work by Dani Alves. Former Aston Villa and Manchester United striker Dion Dublin: "If there is a club willing to pay you £800,000 a week, are you really going to be bothered about the climate and the standard of life? "Manchester City probably could afford it but it's obscene. I don't care how good the player is. How could you pay someone that amount? I'm not having that." Surely it's only a matter of time before Barcelona break the deadlock. Andres Iniesta is denied by a post after meeting Luis Suarez's cross with his head. Kinglsy Coman doubles Bayern Munich's lead. Two goals in the space of seven minutes before half-time puts the Bundesliga leaders in control. Times chief football writer Henry Winter:"I would love to see it happen but I still think it is a long way from La Rambla to the Manchester Ship Canal. "From the Premier League's prospective it would be sensational to have Lionel Messi over here to sprinkle a little bit of gold dust. You have seen how we reacted when Jurgen Klopp came over and put on a masterclass of a press conference. "The fact a real showman could come in like Messi, who delivers, who is probably one of the top five players of all-time, I think Richard Scudamore, the broadcasters, even the rivals clubs, would love to see him over here." They started the day eight points clear at the tp of the Bundesliga and Bayern Munich are showing no signs of slowing down.Thomas Muller's goal gives Pep Guardiola's side a 34th minute lead over Hertha Berlin. Barcelona start from where they left off against Roma. Luis Suarez is clean through but Sociedad keeper Geronimo Rulli makes an impressive save. Long afternoon ahead for the visitors? How Lionel Messi do in the Premier League? Atletico Madrid entertain mid-table Espanyol at 17:15 GMT while Real Madrid will have to wait until Sunday to try and repair the damage inflicted on them at the hands of Barca last week. Rafael Benitez's side are away from home - probably a good thing after their fans reaction at the end of the Barca defeat - against high-flying Eibar (15:00 GMT). How would Lionel Messi do in the Premier League? It is almost three weeks since David Moyes lost his job as manager of Real Sociedad. His replacement is former Barcelona midfielder and ex-Barcelona B boss Eusebio Sacristan. The 51-year-old, who helped Barca win the 1992 European Cup, got his reign off to a winning start with a 2-0 home win over Sevilla. Can Sociedad cause an upset? They might be 14th in La Liga but can Real Sociedad cause an upset? As well as Barcelona, we'll be keeping you up to date with what is happening at Bayern Munich. The Bundesliga leaders have already started against Hertha Berlin. We'll also bring you first half updates from Paris St-Germain's home game with Troyes. Let's fast forward a few months. Let's imagine Lionel Messi has rocked the Nou Camp to the core by moving to Manchester City. How will he do? Will Messi be able to score as many in the fast-paced Premier League as he does in La Liga? Cristiano Ronaldo has already proved he can adapt in England and Spain. Does Messi need to prove himself by moving to the Premier League or should he stay at Barcelona? Barcelona make three changes to the side that hammered Roma 6-1 in the Champions League in midweek. In come keeper Claudio Bravo, defender Jeremy Mathieu and midfielder Andres Iniesta for Marc-Andre ter Stegen, Thomas Vermaelen and Sergi Roberto. Barcelona XI: Bravo, Alves, Pique, Mathieu, Alba, Busquets, Rakitic, Iniesta; Messi, Suarez, Neymar. Real Sociedad include forward Imanol Agirretxe, who has scored nine La Liga goals this season. Real Sociedad XI: Rulli, Aritz, Mikel, Inigo, Yuri, Markel, Granero, Prieto, Canales, Vela, Agirretxe. There's one story dominating the back pages. It involves Lionel Messi and Manchester City offering the Argentine forward a mind-boggling £800,000 a week to leave behind sunny Barcelona for the rainy north west of England. Messi, ever the professional, won't let speculation over his future get to him. He is still on the comeback trail having only returned to action last week after two months out with a knee injury. He is already building up a head of steam after netting a couple of Champions League goals in midweek. Can he bag his first La Liga goal since 20 September against Real Sociedad? They didn't just defeat bitter rivals Real Madrid, they hammered them. They didn't just overcome Roma in the Champions League, theyembarrassed them. Four points clear at the top of La Liga, five straight wins, 18 goals in five outings...life at Barcelona is pretty good right now. Yet are we witnessing the latter stages of Lionel Messi's Nou Camp career? Is the little magician heading for the Premier League to sprinkle his star dust?